Split California into 3 states? SAN FRANCISCO -- California voters may soon be asked to decide whether their state is too big and should broken into three, separate states. 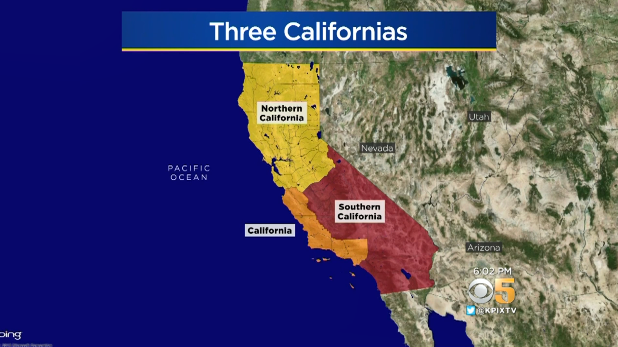 Venture capitalist Tim Draper, who pushed for a six-state proposal, now has a three-state proposal called "CAL3," according to CBS San Francisco. "I'm proud to announce we've collected more than enough signatures to qualify for the 2018 ballot," Draper said. "This would make sure everyone has a government that is responsive and responsible," Draper said. Joe Rodota is the founder of Forward Observer. He's a longtime California political consultant who says this is all a "waste of time." "There area a lot of good ideas that come out of Silicon Valley and this isn't one of them," Rodota said. Take the University of California (UC) system, for example. There are 10 UC campuses in California, which are built and paid for by taxpayers throughout the state. "How are you going to tell a family that lives in Los Angeles they have to pay out of state tuition to go to Berkeley," Rodota asked. There's also water rights, state pensions, prisons and education funding. Figuring all this out takes time and money, and so would setting up three new governments. Rodota says that even if this makes it to the ballot, he doesn't think voters will go for it. "Voters have been skeptical in California," he said. And even if it passes, it all has to be approved by Congress, who might not be eager to dilute their own power by creating four new U.S. senators for the West Coast. Still, Draper says it's California's nature to push the envelope. "California dreams big," he said.